When I was younger people never went out for breakfast but only for lunch or dinner. Breakfast was a quick grab of toast and a cuppa at home or a bowl of cereal to fuel up for the day. Now there is a new generation of food lovers out there from teens to seniors and it isn't all about the full English Breakfast. You can choose from a huge variety of items for breakfast and make dining out at a stunning location your social event for the week. Pelican Pavilion opened just over a month ago. 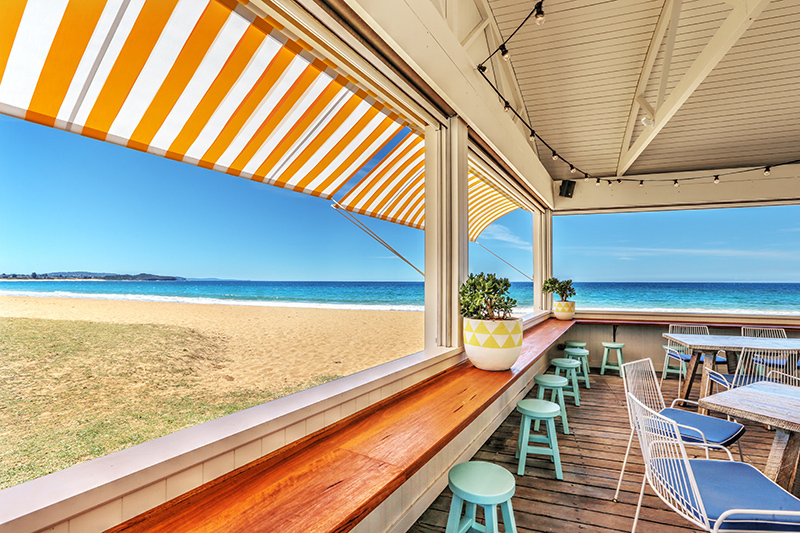 An extension of the fabulous new Collaroy Hotel was once the Surf Rock Hotel, but is now totally refurbished and rebranded. The Pelican Pavilion is a stunning small space already enjoyed by many for their morning coffee, breakfast or lunch. You can even book it for a private function in the evenings. Instantly you will feel relaxed as your gaze in awe at the view. A breathtaking location which fills you with instant euphoria as you realise how lucky you are in Sydney. So many beautiful places to go and this one right on the beach. This is a perfect place to start the day or meet your friends or family for lunch. The fresh sea air no matter what the weather is like, will get your appetite working. There is also an added bonus for families with kids. You can relax with your coffee while the little ones play right on the beach. Or why not take them for a quick swim before you tuck into a hearty meal. There is also another fabulous option which might be of interest to parents that need a bit of me time or anyone that would like to get fit. Every Saturday at 7.30am The Cube Gym are offering a free beach training session right on the beach. One parent could mind the kids or even better get the grandparents or a babysitter and make this a couple's date. Exercise followed by a yummy breakfast would be a fun thing to do together. Post by The Cube Gym - Functional Health and Fitness. The Pelican Pavilion also offers Beach training session entrants menu specials. Breakfast is available from 7am until 11.30am and lunch from 12 Midday until 3.30pm Click here for the menu options. I'm a bit of a traditional girl and always feel a craving for bacon and eggs when out for breakfast, especially by the sea. I was very pleased when I saw my order. If you prefer a healthier option then you can't go past some House Quinoa and Oat Bircher washed down with a coffee from Grinders Giancarlo made from the finest hand picked Arabica beans from plantations in Brazil, Costa Rica and Ethiopia. Or why not have both bircher and bacon and eggs then walk it off along the long stretch of beach from Collaroy to Narrabeen and back. I don't think you could resist the temptation to feel the sand between your toes and the tingle of the waves on the shore. But if you are too full you can just chill out with your friends or check your daily emails on your iPad or laptop as there is also free wifi. You can also stay up to date with their Facebook Page. I think you will quickly become addicted to this new cafe as the location is breathtakingly beautiful and with the delicious menu on offer you really can't go wrong. There is also plenty of parking right next door, free for vehicles displaying a Warringah Council Parking Permit or you can purchase a pay 'n' display parking ticket. Fees: Monday to Friday - $6 an hour or $10 all day. Weekends - $26 all day There are also designated disabled car spaces available. L90/ L85 Buses are also regular on Pittwater Road if you wish to travel from the city for a visit. This cafe is very popular but is well worth a visit. If you can't get a table straight away you could always opt for takeaway and sit in the park at the nearby Collaroy Beach reserve which has a large kids playground or just go to the beach for a walk and pop back to the cafe. Check it out soon, you will love it. Congratulations for getting 2nd place.